Take the motorway exit at km 293 which is signposted "Guadix Benalúa de Guadix". after the motorway slip road a local road takes you 500m towards the town. at the first 'T' junction turn left up the hill. about 150 m after crossing over the railway at the level crossing the road bends to the right. Here on the left hand side you will clearly see a roadsign "Alojamiento en Cuevas - Restaurante 200m" - turn left following this sign to the cave hotel. 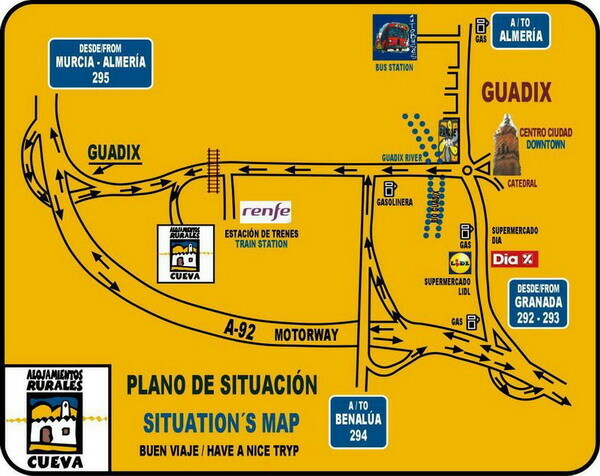 Take the motorway exit which is signposted "Guadix". and follow the signs for Guadix city Center. At the top of the hill just before the entrance to the City you will clearly see on the right hand side a roadsign "Alojamiento en Cuevas - Restaurante 200m". Turn right following this sign to the cave hotel.